Cowabunga dudes! Michelangelo, the youngest turtle, is known for his bright orange bandana, dual numchucks, and his undying love for pizza. Despite being the baby of the group, many suspect Mikey to possess more raw talent than his three brothers combined. Bringing a carefree attitude to the TMNT brotherhood, Mikey is prone to goofing off instead of focusing on his training. However, he is praised by Master Splinter and his brothers for being able to taunt and antagonise his opponents to beat them. 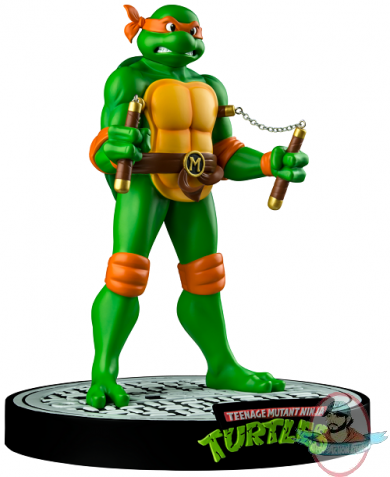 For display versatility, Mikey features an additional head sculpt to show his more playful side.